By participating in this Lucky Draw, all entrants are deemed to have accepted the following terms and conditions. The Terms and Conditions of Ohm’s Lucky Draw govern your participation in the Lucky Draw and are part of your Agreement with us. These terms must be read in conjunction with Ohm’s General Terms and Conditions, applicable Product Terms and Conditions, and any applicable Promotion Terms and Conditions . The Lucky Draw is available to you if you are an Ohm Customer at the close of the Lucky Draw or if you have successfully signed up with Ohm by the close of the Lucky Draw. If you are eligible for the Lucky Draw as determined under clause 2, you will be entitled to one Lucky Draw entry. You will also be automatically entitled to an additional Lucky Draw entry for every full 30 Calendar days that you have been an Ohm Customer from 19 March 2018 (inclusive of this day) until the close of the Lucky Draw. Each customer (1 Ohm account number) can only win one prize. If you successfully signed up with Ohm on 19 March 2018 and received a welcome email from us on that sign-up day, you will be awarded 1 Lucky Draw entry. If you are still an Ohm Customer on 25 December 2018, you will have been with us for 281 days since 19 March 2018. This entitles you to: 281 ÷ 30 = 9.37 ⇒ 9 additional Lucky Draw entries. The total number of entries you will be awarded is 9 + 1 = 10 Lucky Draw entries. If you successfully signed up with Ohm on 1 July 2018 and received a welcome email from us on that sign-up day, you will will be awarded 1 Lucky Draw entry. If you switched retailer during your trial period and successfully switched back to us on 2 November 2018, you will get 1 Lucky Draw entry for the sign-up. The initial period as a Ohm customer will not count towards the award period as there was a break in between. The total number of entries you will be awarded is 1 + 1 = 2 Lucky Draw entries. Entry to the Lucky Draw closes on 25 December 2018, 23:30 hours. Unsuccessful sign-ups with Ohm will not be considered for the Lucky Draw. Ohm reserves the right to review all entries. If an entry is found to be in violation of Ohm’s Lucky Draw Terms and Conditions, Ohm reserves the right, in our absolute discretion, to disqualify entries. These include entries submitted with invalid or incorrect information. The draw will be conducted on 28 December 2018 2pm at the Ohm office at 78 Shenton Way, #16-02, Singapore 079120. Representatives of Ohm will pick the draw from eligible entries. Winners of the draw will be announced on Ohm’s Official Facebook Page (www.facebook.com/ohmenergysg) by 31 December 2018, and will be notified via email. Winners are required to respond within a week from notification in order to be eligible for the prizes. Winners shall collect their prizes within the collection period and at the appointed venue as specified in the notification email or in the form of registered mail. Ohm may ask for a proof of identity, e.g. NRIC upon prize collection. If a winner does not respond within a week from notification, or if that winner does not claim the prize within the collection period, Ohm shall at its discretion determine another winner for the respective prize. By participating in this Lucky Draw, the winner consents to Ohm using and/or disclosing his/her name, picture, and/or voice for editorial, advertising, promotional, and marketing purposes without further compensation except where prohibited by law. The winner may be required to participate in a photo-taking session during the issuing of the Lucky Draw prize. Pictures may be posted online. If you do not agree to this clause 13 you may decline the price at the time of notification. Ohm is not the services or product supplier of the prize and accepts no liability for the services or products provided by the merchant involved in this Lucky Draw. Any disputes arise should be resolved directly with the merchant. Ohm bears no responsibility on the winner’s expenses outside the stated prize. 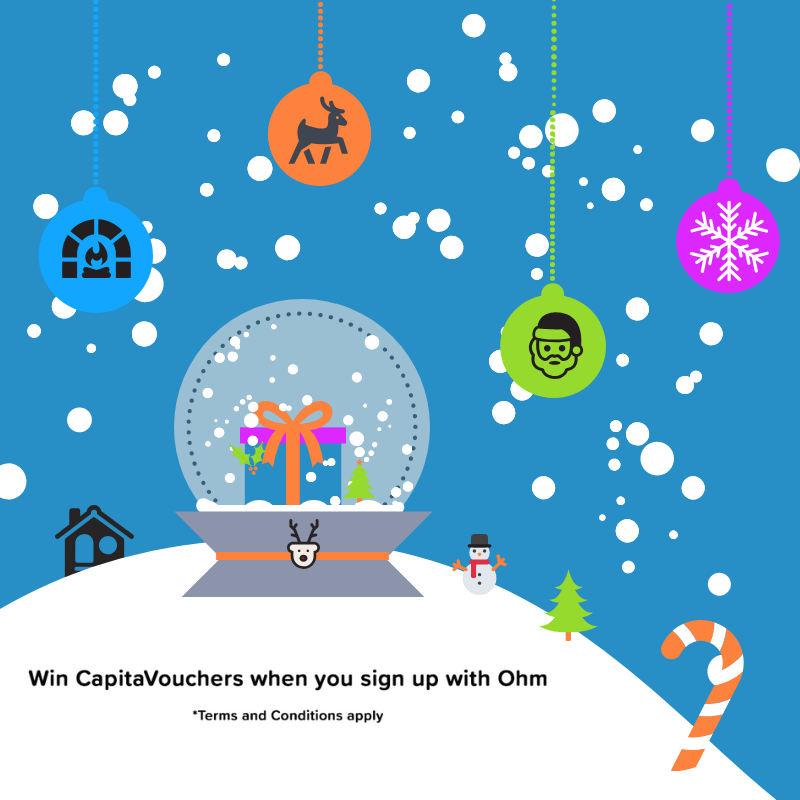 Ohm cannot accept any responsibility for any damage, loss, injury or disappointment suffered by any entrant entering the Lucky Draw or as a result of entering the Lucky Draw or accepting any prize. Ohm is not responsible for any error, omission, interruption, delay in transmission that may result in late, missing or misdirected entries. Ohm is also not responsible for any problems with, or technical malfunction of, any telephone network or lines, computer online systems, servers or providers, computer equipment, software failure of any email or entry to be received on account of technical problems or traffic congestion on the Internet, or at any website, or any combination thereof, including any injury or damage to entrant's or any other person's computer or mobile telephone related to or resulting from participation or downloading of any materials related to in the Lucky Draw. The acceptance of the prize shall constitute a release and discharge of Ohm by the winner from any and all liability, claims, demands, causes of action, and/or damages which the winner may have, whether known or unknown at the present time, of any nature whatsoever, arising out of or relating to: (i) the Lucky Draw contest, (ii) personal injury and/or property damage, theft or loss suffered by the winner as a result of the use and/or enjoyment of the prize, and/or (iii) any tax liabilities in relation to the Lucky Draw contest, prize and/or use or enjoyment of the same. Ohm reserves the right, in our absolute discretion, to withdraw or modify the Lucky Draw and/or its Terms and Conditions at any time, without prior notice and without liability. At the recent road show arranged by the EMA, one of the main topics that came up was the treatment of Transmission Loss Factor (TLF) and how that is charged. Currently, retailers are charged for their customers’ consumption based on the adjusted usage which takes the metered usage and multiplies that volume by the TLF (this factor is currently 1.03493). Thus, we bill our customers based on this adjusted usage, instead of the metered usage. We believe that buying electricity should be fuss-free and we understand that the current method of calculating electricity usage for billing purposes may be confusing to the customer. As such, we have decided to absorb the transmission loss and charge our customers based on metered usage. This will be applicable for customers on Fixed Ohm, Simply Ohm and Ohm Discount. Simply put, you can easily calculate your electricity charges by multiplying your metered usage with your electricity rate. Fuss-free and simple. We expect that in the future, the common practice will be to bill customers on metered usage rather than on TLF-adjusted usage for standard price plans. In the future, we may have to adjust our fixed price contracts for new customers to account for absorbing the transmission loss. However, we only plan to do so towards the end of May 2018. 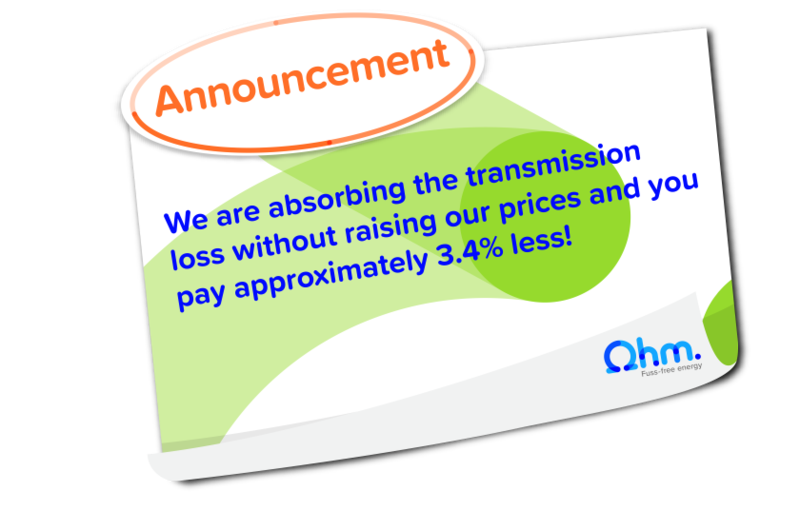 As such, for customers who sign up now, they will enjoy our current low rates with transmission loss absorbed. You, as our customer that already signed up, will enjoy the low rate you are on and the extra savings from us absorbing transmission loss until the end of your contract term. If you have any queries, please reach out to our friendly Customer Care at 1800-835-6463 (Mon-Fri 9 pm to 6 pm, Sat 9 am to 1pm) or at customer-care@ohm.sg. We wish all our customers a Happy Labour Day in advance. In our General Terms and Conditions, we have stated that we will bill you based on adjusted usage. With this notice, we will bill customers who are on Fixed Ohm, Simply Ohm and Ohm Discount based on their metered consumption going forward. This will lower your overall cost. If you disagree with this change, you may choose to cancel your Agreement with Ohm. All electricity charges shown on your bill are before GST (Your GST is calculated as a total sum at the end of your utilities bill). 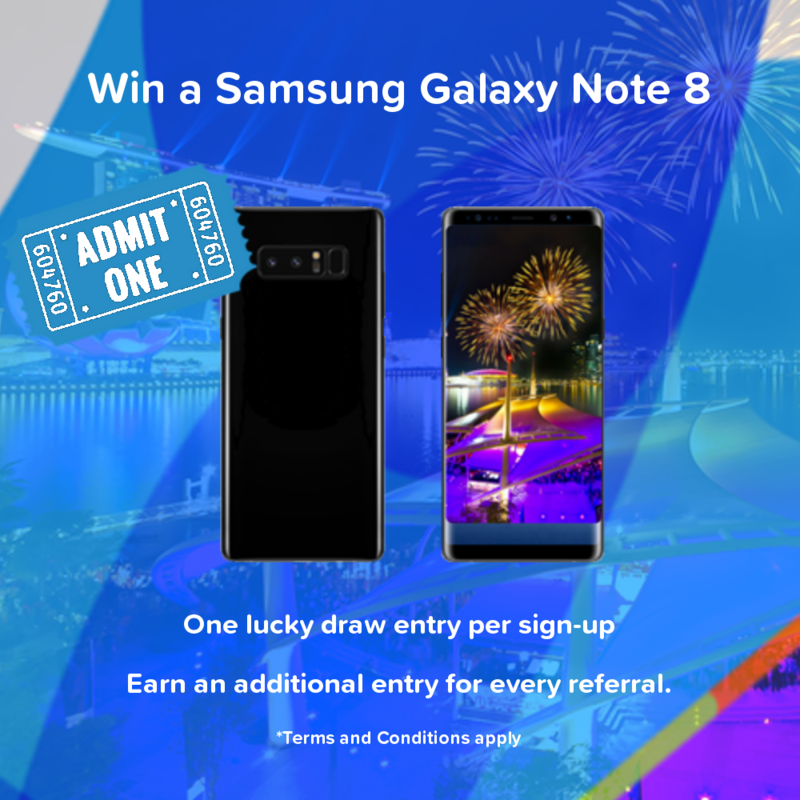 Sign-up with Ohm and get a chance to win a Samsung Note 8 in our lucky draw. You earn an additional entry for every friend or family whom you refer. Customers who have signed-up with us are also entitled to this draw. Ohm your way to a new phone now! The Terms and Conditions of Ohm’s Lucky Draw govern your participation in the Lucky Draw and are part of your Agreement with us. These terms must be read in conjunction with Ohm’s General Terms and Conditions, applicable Product Terms and Conditions, and the Terms and Conditions of the Referral Programme. The Lucky Draw is available to you if you have successfully signed up with or successfully referred a customer to Ohm in Singapore. Each successful signup will be entitled to one Lucky Draw entry. Each successful referral will be entitled to an additional Lucky Draw entry. There are no limits to the number of referrals for the Lucky Draw entries. Entry to the Lucky Draw commences on 19 March 2018 (inclusive of this day) and closes on 31 May 2018, 17:00 hours. All signups must be validated by SP Services before 17:00 hours on 31 May 2018. Unsuccessful sign-ups with Ohm will be disqualified from the Lucky Draw. The prize is a Samsung Galaxy Note 8 (Midnight Black) (worth SGD 1,400). The prize is non-transferable and non-exchangeable for cash or other items, unless stated otherwise by Ohm. Ohm reserves the right to replace the prize with items of similar value without prior notice. The draw will be officially audited and will be done on 01 June 2019 2pm at the Ohm office at 78 Shenton Way, #16-02, Singapore 079120. Representatives of Ohm will pick the draw from eligible entries. The winner will be announced on Ohm’s Official Facebook Page ((www.facebook.com/ohmenergysg) by 08 June 2018, and will be notified via email. The winner is required to respond within a week from notification in order to be eligible for the prize. The winner shall collect the prize within the collection period and at the appointed venue as specified in the notification email. Ohm may ask for a proof of identity, e.g. NRIC upon prize collection. If the winner is below 18 years old, he or she is required to submit parental/legal guardian consent to collect the prize. If the winner does not respond within a week from notification, or if the winner does not claim the prize within the collection period, Ohm shall at its discretion determine another winner. By participating in this Lucky Draw the winner consent to Ohm using and/or disclosing his/her name, picture, and/or voice for editorial, advertising, promotional, and marketing purposes without further compensation except where prohibited by law. The winner may be required to participate in a photo-taking session during the issuing of the Lucky Draw prize. Pictures may be posted online. If you do not agree to this clause 14 you may decline the price at the time of notification.